The Plough Wheel01263 715779work01603 870304fax Self-cateringThe Plough Wheel is a flint cottage situated in Kelling, a village only a mile from the coast at Sheringham and near Blakeney with its nature reserve. The village has an art gallery and cafe and is a good place for walkers and birdwatchers. Holt, an attractive Georgian market town, is close by and there are many other attractions locally including a steam railway to visit. 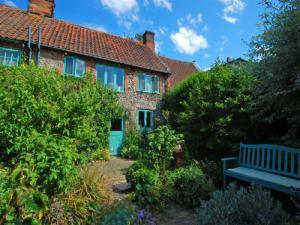 The Plough Wheel is a flint cottage situated in Kelling, a village only a mile from the coast at Sheringham and near Blakeney with its nature reserve. The village has an art gallery and cafe and is a good place for walkers and birdwatchers. Holt, an attractive Georgian market town, is close by and there are many other attractions locally including a steam railway to visit. From A148 Leave Holt on Old Cromer road. Pass 2 filling stations, over crossing, right into Kelling road signed to Kelling. Proceed 2 miles, keep on left fork, past Kelling church.